The world-acclaimed Jaipur is now available as a digital game with an exotic campaign mode that will guide you through the different regions of Rajasthan. Since its original release in 2009, Jaipur has been nominated and awarded several prizes around the world, such as Spiel des Jahres (recommended), International Gamers Awards (finalist) Spanish Game of the Year (winner), GAMES’s Best New Family Card Game (winner), Fairplay’s Best Card Game of the year (winner) BGGeek’s Best Card Game (nominee) and Best 2-player Game (nominee). Jaipur is also currently ranked 10th on BGGeek’s Best Family Games huge list​. 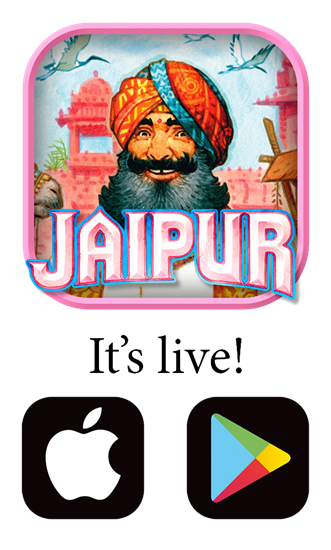 Jaipur is both available for iOS (https://itunes.apple.com/us/app/jaipur-a-card-game-of-duels/id1193262249?mt=8) and Android (https://play.google.com/store/apps/details?id=com.meepletouch.jaipur).